Last summer, they entered the demolition phase of the project and closed off the sidewalk in my busy urban neighborhood where hundreds, if not thousands, of pedestrians would otherwise walk every day. When the project halted for winter, I was troubled to see that the sidewalk continued to be fenced off, in spite of the fact that the demolition crew had clearly departed and taken all their equipment with them. This was pure laziness. After a couple days when it became clear that the fence wasn’t going anywhere, I contacted my landlord who is also the owner of the building under demolition and construction. I was pleasantly surprised to receive a response that said they’d make sure the fence was removed promptly and it was. But I feel supremely lucky. It is far from the norm to see results like this. And it shouldn’t be something I have to ask to be done—I shouldn't have to milk a personal connection to do it. Within a few months of the sidewalk being restored, it was closed off again and, months later, it's still impassable. The situation is not just inconvenient, but dangerous — especially for the children, seniors and wheelchair users in my neighborhood. One of Milwaukee’s historically industrial neighborhoods, Walkers Point, is undergoing some transition toward being a restaurant destination, and that means other additions like housing and retail, too. One such example is a new grocery store plus a mixed-use apartment/commercial space that was constructed recently on an empty plot of land. The neighborhood was thrilled with this news — there aren’t any grocery stores nearby and the space had been a vacant lot for years. But that excitement turned to disappointment when the plans for the grocery store were revealed and its design looked exactly like a suburban big box store. Instead of embracing the more dense development emerging in the neighborhood, the designers of this new store decided that the building should be set back considerably from the street, with an ocean of parking between the sidewalk and the entrance. This auto-oriented design makes it pretty clear just why the project engineers decided they needed to close the sidewalk surrounding the project while it was under construction. Despite the fact that, as you can see in the photo above, the mixed-use building under development is a fair distance from the sidewalk, it looked as if the project engineers had simply decided, “Well, this is a good place to stick our fence. Nobody walks here anyway…” Which is completely false. When I took the above photo, I was walking here. And what’s more, I witnessed two young men, one in a wheelchair, also heading down the sidewalk in front of me. We received no warning that our route would suddenly be cut off, and of course, there was no curb cut at this point for the wheelchair user to safely get to the street. Worse still, this is an excessively wide, fast-moving street, and midway down the block is an incredibly dangerous place for anyone to cross, but especially a mobility-limited person. If his friend had not been with him to help coax the wheelchair into the street and hustle it across to the other side, he might not have made it. I took my chances walking in the street. Last summer, a friend came to visit and, eager to show her my city on a rare beautiful day, we headed downtown. At least three separate new buildings were going up on either side of one of our main downtown thoroughfares, Water Street. A few blocks into our walk, we encountered a sidewalk completely closed and full of construction equipment. Frustrated and seeing no safe way to continue along the edge of the construction zone in the road due to the fast-moving car traffic, we turned to cross to the other side of the street. We were forced to wait several minutes just for a break in traffic since there were no lights or stop signs at this intersection. I shudder to think how a person with a walker or pushing a stroller would have handled this. We practically had to sprint across the street. But that’s not the worst part. A block later, we encountered another construction project on the side of the street that we had just switched to! Again, the sidewalk was completely closed and again, the street was terribly unsafe to cross. We resigned ourselves to walking around the block on some slightly less busy streets, directly in the lane of traffic. In neither of these instances was much, if any, car traffic blocked in the street. 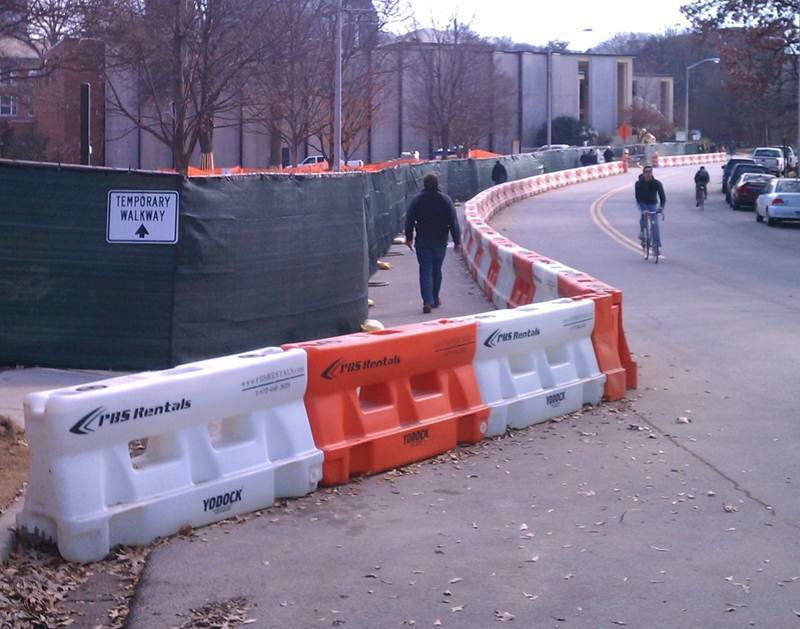 The amount of construction space gained from fencing off a few feet of sidewalk was negligible, but the resultant damage done by this decision to pedestrians was serious. For months, and, in some cases, years, the sidewalk was completely inaccessible. As evidenced by these new developments, downtown Milwaukee is a neighborhood that’s seeing increasing investment, particularly in new housing. But the precedent set by these construction companies goes completely counter to the goal of a walkable, livable downtown. You’re driving to the grocery store when all of a sudden, the lane you’re using is barricaded and rerouted into the opposite lane, and you’ve got to wait for a break in high-speed to traffic to get over to the other side. 10 seconds after you’ve finally managed to cross, you encounter another barricade and are forced to do the same dance all over again. These hypotheticals would simply never happen. And if they did, there would be immediate outcry, especially if the barricades were present on a busy route that people frequently traveled on their way to work. I generally try to steer clear of arguments that begin with “Well, in Amsterdam…” or “In San Francisco…” But in this case, I think there is value in saying that in New York City, where I used to live, there are specific rules set out about pedestrian safety in construction areas, and we in Milwaukee can learn something from them. Temporary walkways are required by law any time a sidewalk is taken out of commission due to construction (which happens a lot in the city). They’re required to be wide enough for safe passage, accessible for people in wheelchairs and protected from construction debris. In a city like New York, it’s inexcusable to block off a pedestrian pathway without providing an alternative — plain and simple. This should be the case in all of our cities, and it’s not hard to achieve, either. Some signage that directs people, temporary wooden ramps where needed and generic barriers that protect pedestrians walking in the street (which most construction companies likely already have at their disposal anyway) are all that you need. In order to accomplish this, we need our local leaders to step up and make it a legal requirement for construction projects to preserve or provide an alternative for pedestrian space, and we need development companies to take a few simple steps to put this requirement into action. It won’t involve much effort on the part of any of these entities — like I said, we’re talking about a few feet of sidewalk width — but the positive impact for anyone walking (and that includes people walking from their car into a business or residence) will be significant. What small steps can we take to fill sidewalk gaps? My city spent $1.4 million on new street lights and not a cent to build badly needed sidewalks. What can we do?